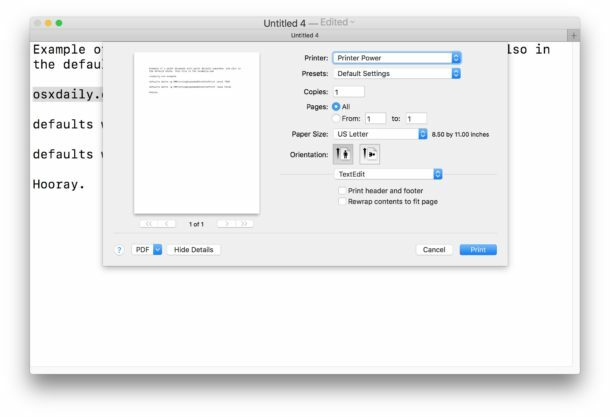 Do you frequently access the detailed printing options when printing from a Mac? If so, you’ll really appreciate this trick to always show the expanded print dialog window and settings screen. For some quick background, typically when you go to print if you want to see expanded printing options like print paper orientation and paper size, you’ll need to click the “Show Details” button when printing a document. 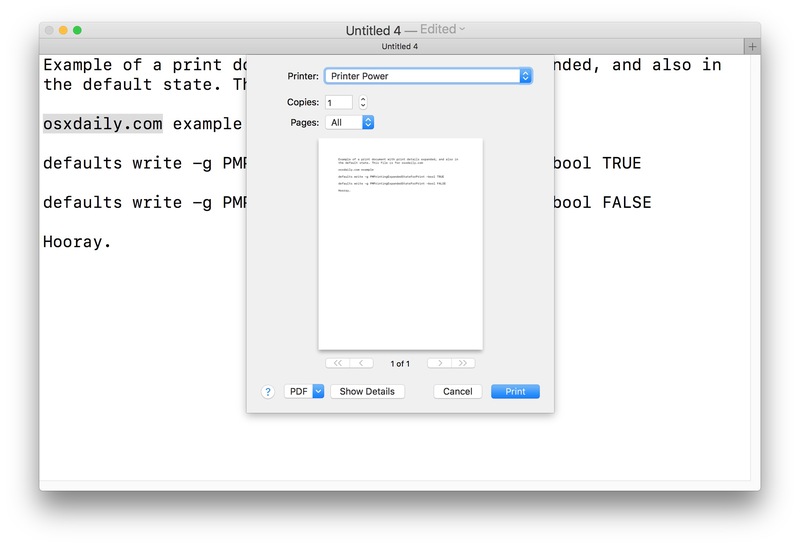 But with a little command line trick, you can make the expanded print dialog window the default setting in Mac OS when printing, so that you won’t have to click “Show Details” every time you print a document to make adjustments. The expanded Print dialog window in Mac OS shows many additional print details and configuration options for printing documents, including specific page counts, the page and paper print orientation, paper size, preset settings options, printing double sided, printing borders, whether to print the header and footer of a file, whether to print in black and white or use color ink cartridges, and much more depending on the document in question and the app doing the printing. 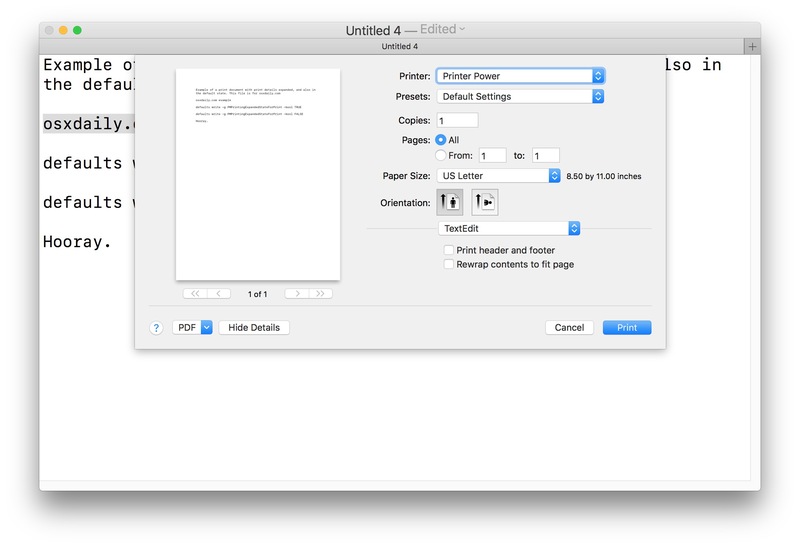 This is all quite useful information to adjust and toggle as needed for people who do a lot of file printing from a Mac, so this article will discuss how to make the expanded printer options showing all these details (and more) available by default with each print attempt. This will change the default print setting in Mac OS so that every time you go to print a document, the fully expanded detail print dialog shows. You shouldn’t need to restart the Mac or relaunch any apps for the change to take effect, but if you have an active print dialog window open when you use the command you’d need to close it and start the print process again by summoning it through the File menu or the Print command. Typically to show those additional printing options you’d need to click the “Show Details” button at the print dialog, but with this defaults setting it becomes the default. This will impact all new printing attempts on the Mac, expanding all details of printing options available, and from all apps too, whether you’re printing a document to a printer or even printing to PDF on the Mac, and whether its a local or network printer doesn’t matter either. The command works on just about every version of macOS and Mac OS X, regardless of how the m in Mac is capitalized and whether or not their are spacing in between the characters of the version name. That will return MacOS to the default state of not showing the full expanded print window. This trick is similar to another defaults trick that sets the expanded Save dialog to show as the Save default in Mac OS, and if you like as many options as possible available to you when saving or printing documents you’ll probably want to enable both of these tricks on your Mac through the defaults command strings. Do you like the expanded print dialog window on a Mac? Do you have any printing tricks up your sleeve? Share your comments below! Interesting. Try to Click on “Hide Details” and it will hide the expanded print options. Even after checking it using defaults read -g PMPrintingExpandedStateForPrint (which returns 1), I still get the non expanded print options. I’ve not rebooted or logged out but I have run a killall Finder. defaults write -g writes to the global preferences domain, over which the application domains take precedence. If you want this to work in Safari, Firefox, Chrome, etc., then use their preferences domains instead, e.g. Hello, when using Keynote, how do you create a red box around a portion of text that is part of an image that has been inserted into a slide. For me this did not work until I issued the command as sudo. WHich seems odd because I run with admin level. Regardless a useful tip. Thanks. The excellent, free program, Tinker Tool, lets you set this (and many other features) up easily. It’s been around for a long time. Any long time Mac user will vouch for its stability and reliability.